Hysterical overreaction tends to follow everything Luis Suarez does. He is the new pantomime villain of world football; a modern day bogeyman. Now FIFA have rendered their verdict and we begin another season without our star player. Much of the criticism coming his way is entirely justified. I have even waded in myself. However, I am slightly uncomfortable with being lumped in with frenzied response of some commentators and fans. Let me be clear. When I first heard what Luis had done I couldn’t believe it. “What has he done to us now? After all the support we have given him he has dropped us in it once again.’ I suspect this was the initial gut reaction of many Liverpool fans. As I cooled down I was able to rationalize that biting was not acceptable on a football pitch (or anywhere for that matter) and neither is breaking someones leg, headbutting or elbowing them in the face. Such transgressions could and should result in a punishment, probably a ban. In Suarez’ case I reasoned it would be a lengthy ban due to the fact he was a repeat offender. This was likely to damage my club and our chances of mounting a tilt at the title next season. It also puts my club and the manager in a terrible position in the transfer market. Therefore, I would argue my “outrage” at Luis is reasoned and fair. The same can’t be said for others. Some of it while overblown is understandable. However most is just, well hysterical. Take Glen Hoddle for example. No please take him. Seriously. I am no expert in psychology and judging by his post incident analysis neither is he. Following Suarez’ third bite at the cherry he gave us a very Freudian analysis of the situation. “Something must have happened to him as a child” he stated with all the confidence of an expert in the field. Maybe it did, maybe it didn’t. What is clear is that there too many people are passing judgement on things they know little about. I must confess I have referred to him as a mad man but I wasn’t offering a clinical diagnosis. I just meant his actions seem mad. Well they do. Others have joined in. Mentally unbalanced, deviant or round the bend are just a few of the phrases bandied about on social media and via text. To the untrained eye Luis seems to have a problem with impulse control, particularly in high pressure situations. Lots of people do. Consider Zidane’s headbutt on Materazzi; Cantona’s Kung-Fu kick or the Pardew incident last season. There are of course many more but you get my point. Whatever Suarez problem is, he has been getting help at Liverpool and it seemed to be working. Maybe Uruguay need to provide the same help and support. Does there really need to be such an over the top reaction? Maybe it suits the nations media to hold such an inquest into the actions of a Uruguayan whilst playing Italy following England’s ignominious dumping from the competition. Who knows. Then there are the conspiracy theorists who suggest that this is a ploy by Suarez to engineer a move away from Liverpool this summer. To be fair I can understand this argument a little. Luis does have form in this department too. However, such suggestions fly in the face of all reason. Would Luis really risk a career ending ban on the off chance Liverpool would be willing to sell him to Madrid. If this is true, then maybe he is mad after all. For me such theories imply a degree of planning and thinking that just doesn’t seem to be there. To quote a kitchen conversation in work today, I don’t believe Suarez knew he was going to bite Chiellini until the moment he did it. If he was planning to engineer a move away there a far better ways of doing it than risking your career and losing the chance to play in a World Cup final. I don’t buy this theory. Despite his post match interview, I thought it was clear that Luis knew the gravity of what he had done. He cut a dejected figure leaving that pitch. He didn’t look to me like he was thinking ‘job done’. It is said that when someone attempts to discredit another’s argument by comparing it to Nazi doctrine, they have clearly run out of ideas. For me the same is the case every time someone drags the name of Shankly or Paisley into the frame. Now these men are Liverpool’s equivalent of the father and the son with Kenny being the holy ghost. I’ve lost count of the number of times I have been told that Shanks or Bob would have kicked Luis into touch by now. They possibly would have. However, it’s worth pointing out that the great man once said he would break his own wife’s leg to win a game, but he would never cheat her. Shanks like the bible is a little ambiguous when it comes to the morals of the game. For me the bottom line is that Luis has let Liverpool down again. he has put the club in a terrible position. I don’t know if it is possible to turn this around, but I fear it isn’t. A parting of the ways seems inevitable and it could be for the best. Worse still he is now looking at a four month ban. 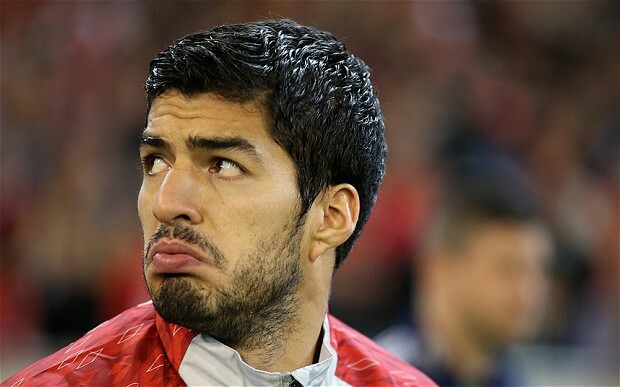 Imagine having a player of Luis’ talent unable to play and drawing £200k a week in wages. For Luis his dream of leading his beloved Uruguay to the World Cup Final have vanished. Surely things are bad enough without all the overblown hype.